Having possibly dented Ferro’s confidence and certainly putting a bit of a hole in my own at Bicester & Finmere the obvious solution was to build ourselves up as quickly as possible. Shaun Marsh kindly let me have a school at Felbridge during one of his combined training competitions. 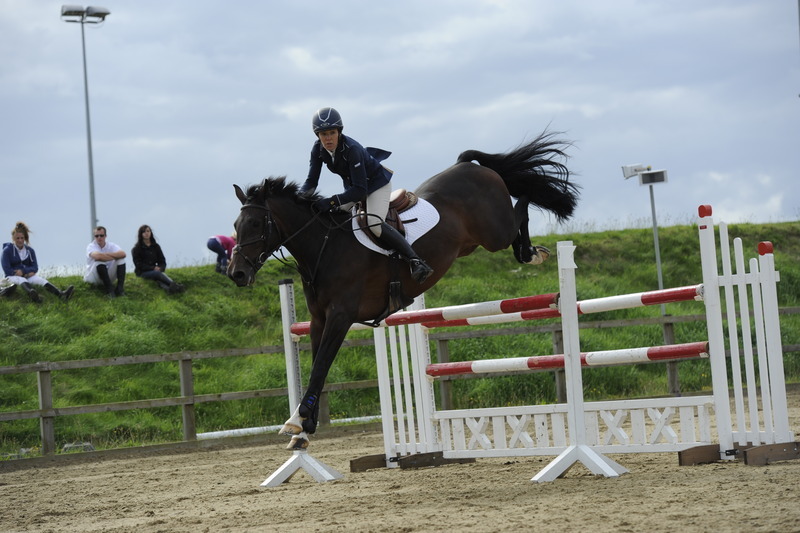 It felt very strange jumping Ferro round 1.00m and 1.10m, surprisingly scary in fact, but she felt relatively happy. I then took all four horses schooling at Golden Cross on the grass, where they all went well, although I did manage to fall off Biscuit – and I think Ian was a bit amazed at how many horses can fit into my Tardis-like lorry. After Addington I managed to take both Ferro and Biscuit for a lesson with Shane. Starting with Biscuit, Shane watched me jump her through a grid and then asked to ride her. I have found her difficult in the mouth from the beginning and have found the balance between what I am prepared to put up with and what she is prepared to accept difficult to achieve. However, Shane decided that Biscuit is no longer going to be the one who decides what is acceptable! When I got back on the result is still work in progress, but I am much more confident in sticking to my guns now and Biscuit is definitely getting the idea and feeding off my renewed confidence. Ferro then jumped really well, I have been letting her drop behind my leg, and I think confusing speed with power – even after all these years!I then spent four days at the Young Horse Championships at Addington with the Old Lodge Horses. The standard of competition there was very high, one fence in the Five Year Old Final was 1.38m which gives some idea of what is expected of these young horses – I was very glad that Emma was safely in her bed – as I really don’t feel she needs pushing that hard yet. It was fascinating watching all the horses over the four days, some improve every day and for some the wheels really fall off in the final – for the latter the work that will have to go into restoring their confidence will be considerable. The benefit of all this hard work was seen at Felbridge this weekend where Biscuit jumped a lovely double clear in the Newcomers, Emma jumped another Foxhunter for one down in the jump-off and Ferro jumped like a tiger in the 1.30 and just stroked off the last fence in the jump-off. Sadly the finances were badly affected by some major brain-freezes from the pilot – strange routes in jump-offs. My excuse is Anna giving a lovely party the night before to celebrate being 25! Not only was I feeling extra old – but perhaps less champagne would be better on a school night!After another trip to Addington to watch Golden Hawk and Shane qualify for the Grade C Final at Hoys – the Old Lodge tally for HOYS is now three as Lord of Arabia is also qualified, I took Emma and Ferro to Crofton Manor. After a horrendous journey full of bank holiday traffic I arrived in time for Emma to win the Newcomers and to just have one down in the jump off of her first Foxhunter. Ferro won the Foxhunter, but had a cheeky spook in the 1.30. Back to Shane with Ferro and Biscuit. Biscuit had practiced every day and although it was still hard work some improvement was acknowledged. Ferro has now jumped every sort of spook imaginable, and I certainly had her in front of the leg – the alternative would certainly have been a quick posting into some sort of spook! Hopefully we are now all ready for the All England Jumping Championships at Hickstead next week and then on to Arena UK, before giving the girls a winter break.Homer has had his first day’s autumn hunting with me. This is the only good thing about summer drawing to a close – although getting up at 4.15 is hard work. He is such a civilised horse and it was a beautiful morning with the hounds being very busy following their trails both in the woods and across a few fields. Luckily the ground was not too hard and we could enjoy a bit of a spin and a few little jumps. Clearly hunt jumps are scarce with the Scarteen as he was a little bit green at the first few, quickly getting the hang of them, but a rusty hurdle in some wire was clearly very familiar. It is amazing what you can acheive if you get up at 4.15. By 2.30 I had been hunting, ridden Emma and had a lesson on both Biscuit & Ferro! I then had a long lunch with Shane & Chloe to recover.